Sakura means cherry blossom (though it can also refer to the cherry tree). Shinguji here uses kanji at variance with the usual kanji used for this name; Shinguji is a real Japanese last name, but not in this form. These kanji mean true + shrine + temple. Since the Meiji Restoration, Shinto shrines and Buddhist temples have been set more cleanly apart than in the past. The meaning of the name is thus, at once, the beauty of a cherry blossom and a repository of true Japanese cultural values. 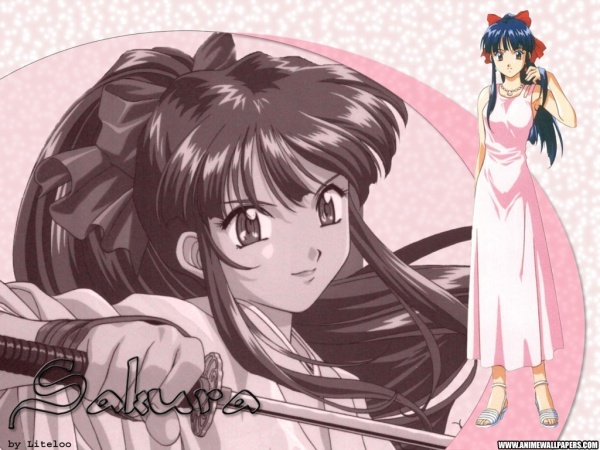 Sakura Shinguji is the heroine at the heart of the Sakura Wars (“Sakura Taisen,” or サクラ大戦) franchise from game publisher and one-time console manufacturer Sega. The game series is not so much named after her as taking the theme of young, beautiful women battling against the forces of darkness. At first, the series takes place in Tokyo. The era is the 1920’s. Although modified along the lines of so-called steampunk, that is, imaginary steam-based machines (powered, per se, by the spiritual power, or reiryoku (霊力), of the pilots where the members of the Flower Team (hanagumi, 花組) are concerned. This force is based out of Ginza in the Grand Imperial Theater, with the troupe of all-female stars of the stage under a name that is pronounced the same way, but with kanji making it out to be an opera troupe only. Thus, it is a secret organization devoted to defense of the Empire, but with recruits from around the world. In the first game, and at the start of the related manga and anime plots, Sakura is an optimistic, 19 year old girl who is getting her first brush with the modern world. Compared to mid-1920’s rural Sendai, Tokyo is a shockingly huge and busy place; even trains, steam-based automobiles (since this is steampunk), and the crush of people, are all overwhelming. To Sakura, this is a world of wonder, something to be embraced rather than feared. While Sakura has dreams of starring on the big stage herself, she is rather clumsy, both figuratively and literally. This is not because of a lack of physical aptitude, but rather, failures of concentration; it’s such a new world, she’s still lost in it. 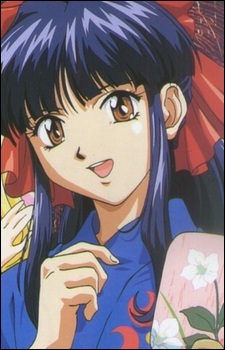 Sakura is earnest and sincere, though she has a mischievous sense of humor. She is a strong believer in teamwork and helping people and is, therefore, quite idealistic. 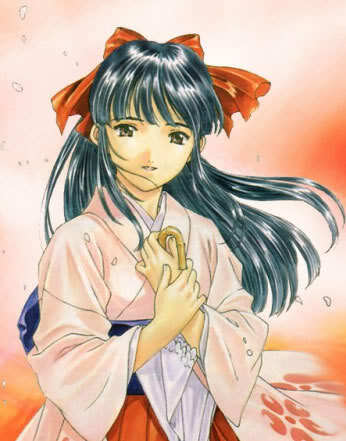 However, she has a strong will that manifests itself at times of crisis, standing up for her friends, her country, and her own love and admiration for recently anointed team leader Ensign Ichiro Ogami. Thus, aside from being very easy on the eyes, she has practical combat power worthy of a main heroine in her own video game/ manga/ anime. 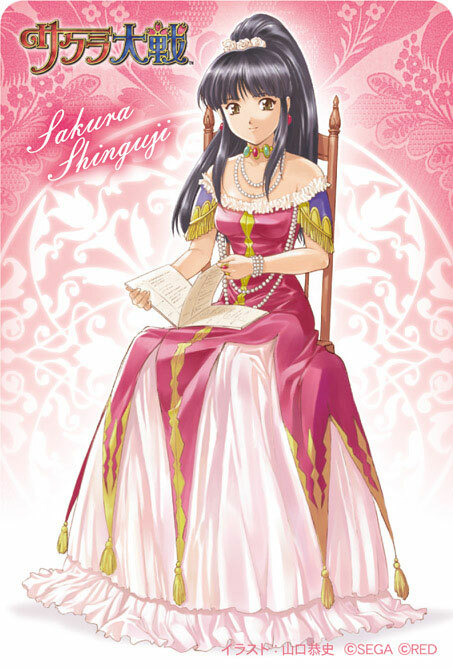 Sakura is also an immense fan of not only opera and theater in general, but romantic plays such as Cinderella. Indeed, Sakura is often trying to practice the lines in Cinderella to truly perform well as the character. Aside from teaching cultural values and to be more than a secret military outfit, this is training in discipline, concentration, footwork, and coolness under pressure. Of course, being new on the stage, Sakura sometimes has… let us say, incidents, that create some friction with other members of the troupe/ team at times. They’re all part of her enduring charm. 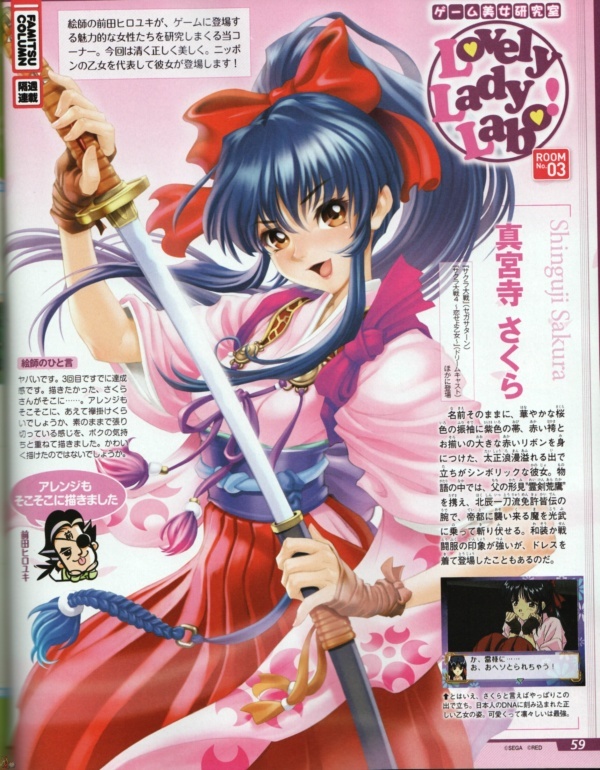 While the heyday of the Sakura Wars franchise has passed us by, Sakura Shinguji is an instantly recognizable cultural icon who seems to embody all of the best of old Japanese cultural values in a beautiful, approachable, kind, gentle, and very human vessel. 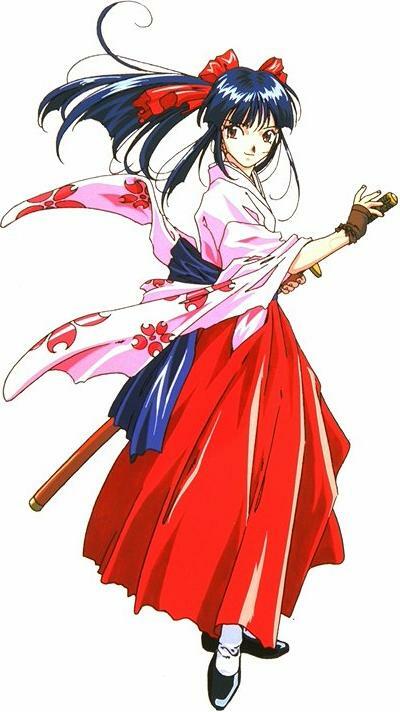 She presents not only a femininity that is innately appealing to the male spirit, but is an outstanding swordswoman (post-Meiji, we cannot call her samurai but this is simply a technicality) whose faith, devotion, and fierce spirit make her a dependable ally and teammate. Loves pretty much anything romantic. Frightened by lightning (traumatic childhood experience). Panics at the mere sight of a mouse. This entry was posted in Anime, Culture, Japan, Manga, video games and tagged anime, Cinderella, culture, Japan, katana, Manga, Sakura Shinguji, Sakura Wars, samurai, steampunk, Tokyo, video games. Bookmark the permalink.